International Women's Day Special Networking Event! 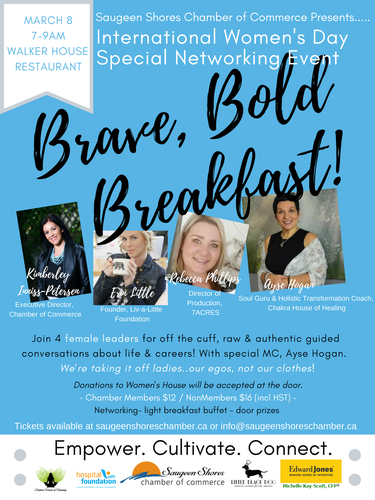 Join us at a very special Saugeen Shores Chamber of Commerce networking event on March 8th in honour of women! Women in business, politics, finance, law, medicine and beyond! Women overcoming hurdles, pushing boundaries, and finding opportunities to grow all while balancing family and personal lives. Four local female leaders will engage in off-the-cuff, raw and authentic guided conversations about life and careers! With our special MC, Ayse Hogan leading the way. We're taking it off ladies....our egos not our clothes! Kimberley grew up in Newfoundland to a mother who battled poverty, mental health and addictions. At the age of 20 with a relentless spirit to lift herself out of the poverty trap, she enrolled in university where she graduated with a BSc in Physiology & Psychology from the Faculty of Science and Research. Kimberley has since become a registered Human Resource professional and earned an MBA in Social Innovation. In her spare time, she provides pro-bono business consultation services to grassroots social profit organizations as her way of helping to make this world a little gentler. Erin is a former school teacher turned homeschooler. She fills her days being the CEO of her home, managing medications, diets, curriculum, and breaking up fights over tutus. But she has found the upside of her life challenges and has transformed something that could be so devastating into what she calls Living Rare. Living Rare is about living the life you were born to live instead of the one we were conditioned to live. Erin is full of determination and grace, her number one goal is to be the role model her children need for them to grow into self-sufficient human beings that were born to love and be loved. Rebecca's journey has taken her from an office admin, to procurement manager and for the past year, overseeing all of Production. Rebecca grew up in Burlington Ontario and moved to Kincardine 10 years ago after she fell in love with the town. With relentless passion that was so obvious in her work, she climbed her way to where she is today. Ayse's story is one of healing... 'The right people came into my life and saved me when I was ready to end my own life. It changed me to my core and changed everything about my life. I trained, learned studied and now, as a Soul Guru and Holistic Life Coach at The Chakra House of Healing, I help women help themselves and I am living my purpose. There is nothing better than that.' Ayse has a Doctorate in Philosophy, possesses numerous certifications in healing including Reiki and hypnotherapy, and is a published author and accomplished speaker. Donations for Women's House will be accepted at the door.